Deborah J. Murphy was born and raised in North Platte, Nebraska and received her B.A. in Art Education from Kearney State College, (now the University of Nebraska - Kearney). She has been working as a professional artist since the early '70s, has shown extensively around the mid west. She maintains a studio in Omaha, Nebraska and is an adjunct at Metropolitan Community College. 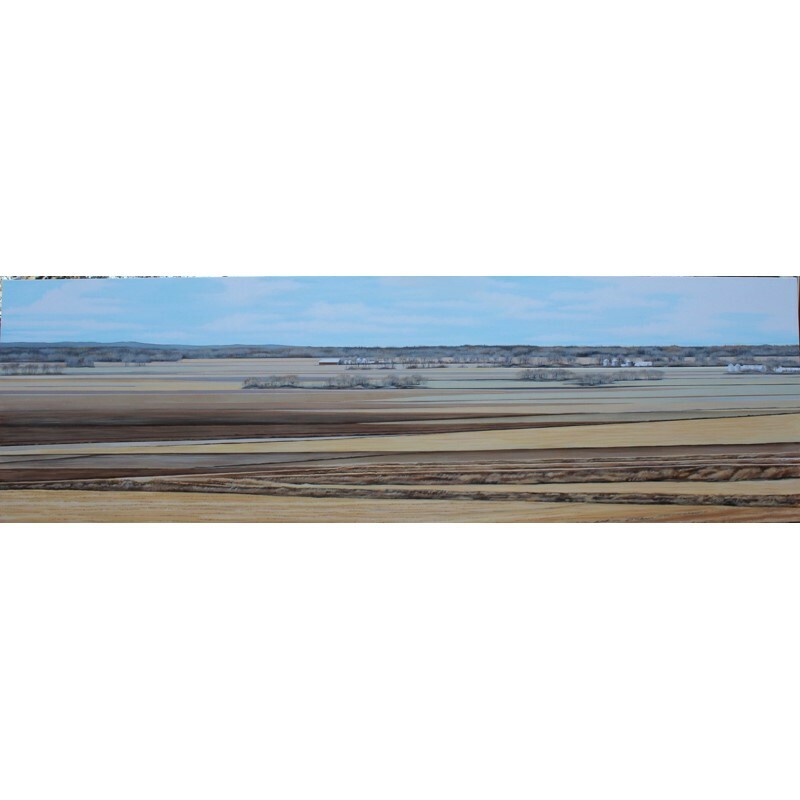 My work has always addressed the reality of everyday surroundings, with major emphasis upon the eastern Nebraska landscape. My creative intent lies with how best to portray depth and perspective through strong compositional elements. The land parallel to the Missouri River near the area I live - it's that geography which continues to draw me back. The stark contrasts of the winter months in particular appeal to my eye. In regard to my Prismacolor drawings of the land I have written . . . Grass lined sloughs have been my focus, as I find them to be beautiful in their simplicity . . . for the most part a straight, narrow line of water with reflections of the environment. My interest in architecture began as a child and evolved into a love of geometric design, incorporated into the bold horizontal compositions characteristic of earlier landscapes. 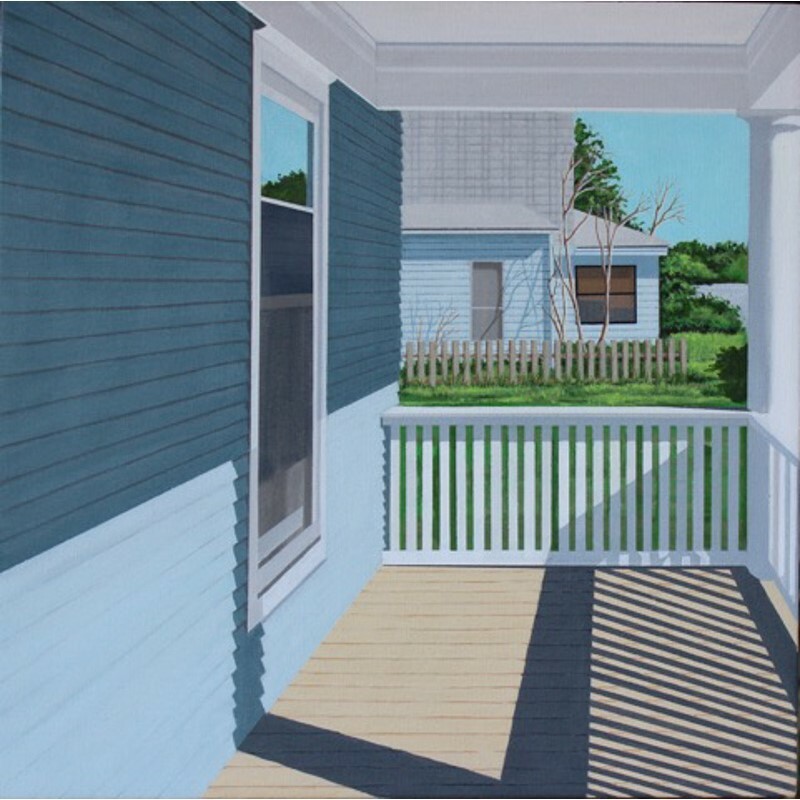 Eventually the interest expanded into an exploration of the contrasts between light and dark, older architecture (specifically white clapboard structures), shadows, the effects of light, perspective and repetition of form. What began as a pure design issue has developed further into specific psychological considerations in the selection of the image. The focus lies with the concept of shelter or the safety one feels within the idea of "home" versus the perception of uncertainty on the "outside". The dramatic appeal of these paintings then, deals not with nostalgia as one may consider at first glance, but with the recognition of warmth, security and longing. 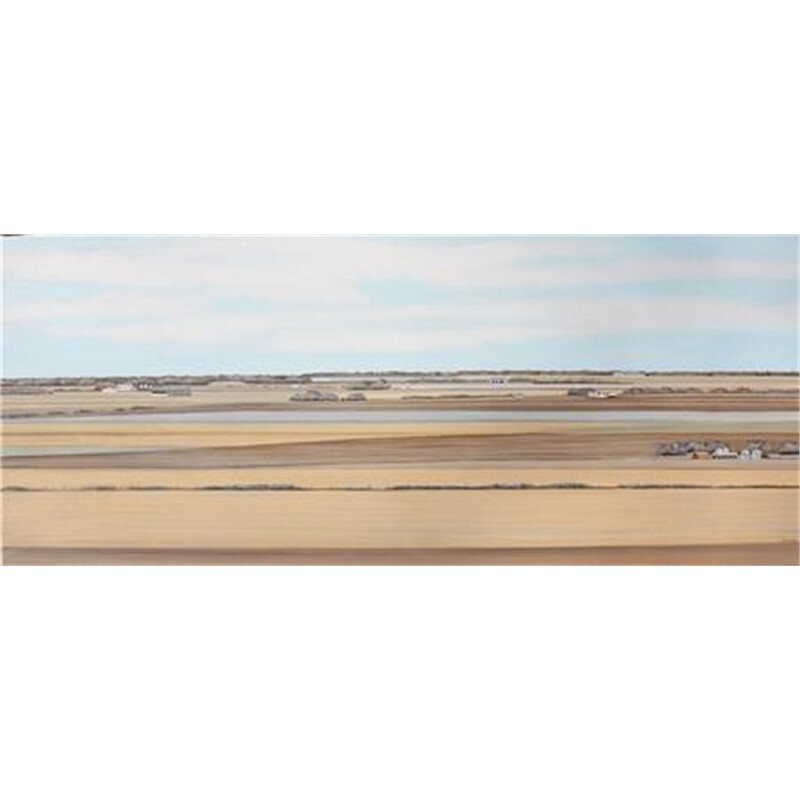 The work emerges as an effort to capture the pastoral quality of the midwest, with its delicate and elusive beauty, but also to put forth a dramatic appeal through the combined landscape and the quietude of the porch paintings. Deborah J. Murphy was born and raised in North Platte, Nebraska and received her B.A. in Art Education from Kearney State College, (now the University of Nebraska - Kearney). 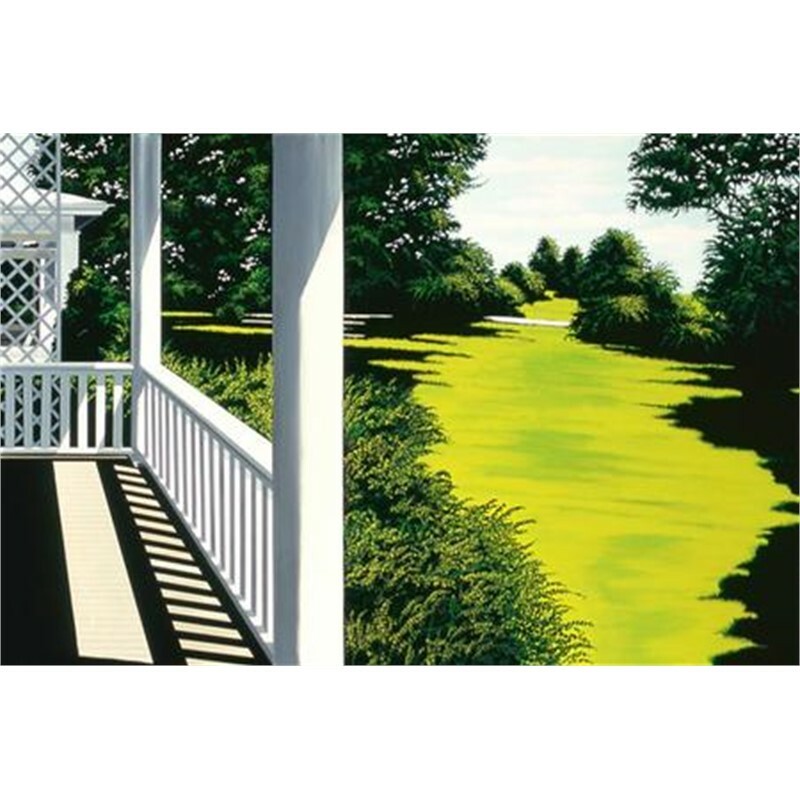 She has been working as a professional artist since the early '70s, has shown extensively around the mid west. She maintains a studio in Omaha, Nebraska and is an adjunct at Metropolitan Community College. Statement My work has always addressed the reality of everyday surroundings, with major emphasis upon the eastern Nebraska landscape. My creative intent lies with how best to portray depth and perspective through strong compositional elements. The land parallel to the Missouri River near the area I live - it's that geography which continues to draw me back. The stark contrasts of the winter months in particular appeal to my eye. In regard to my Prismacolor drawings of the land I have written . . . Grass lined sloughs have been my focus, as I find them to be beautiful in their simplicity . . . for the most part a straight, narrow line of water with reflections of the environment. My interest in architecture began as a child and evolved into a love of geometric design, incorporated into the bold horizontal compositions characteristic of earlier landscapes. Eventually the interest expanded into an exploration of the contrasts between light and dark, older architecture (specifically white clapboard structures), shadows, the effects of light, perspective and repetition of form. What began as a pure design issue has developed further into specific psychological considerations in the selection of the image. The focus lies with the concept of shelter or the safety one feels within the idea of "home" versus the perception of uncertainty on the "outside". The dramatic appeal of these paintings then, deals not with nostalgia as one may consider at first glance, but with the recognition of warmth, security and longing. 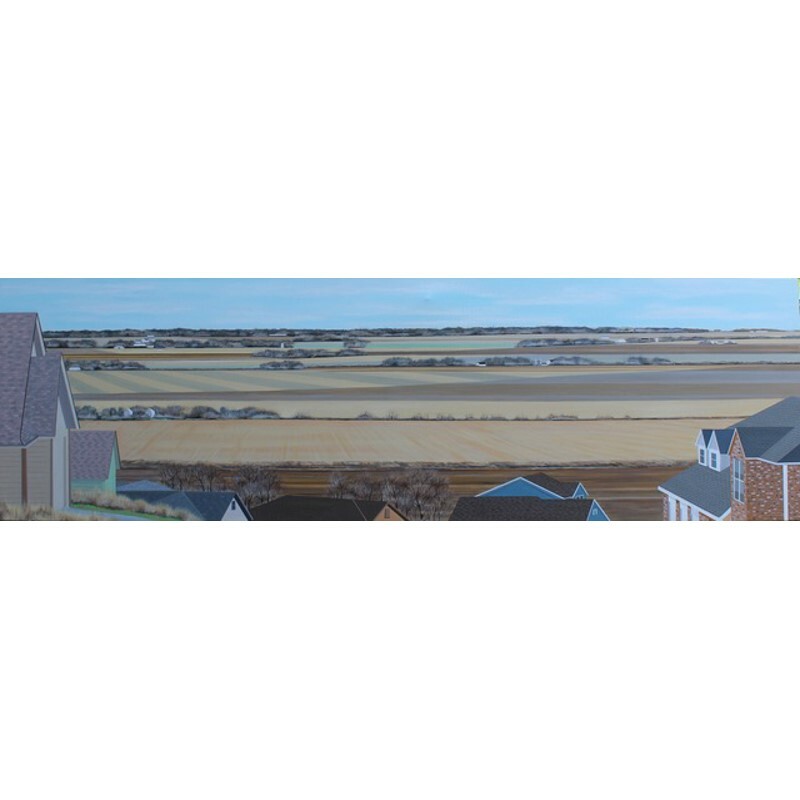 The work emerges as an effort to capture the pastoral quality of the midwest, with its delicate and elusive beauty, but also to put forth a dramatic appeal through the combined landscape and the quietude of the porch paintings.